This cruiseline did everything right. From the food to the excursions to the staff they could not have been nicer or more accommodating. They seemed to have thought through everything ahead of time and I would classify this less of a “trip” but an “experience”. Kudos to the chef, the captain and especially our ship host, Song. I had a special meal requirement and the staff was very helpful. Some might have thought it was corny but I also thouroughly enjoyed the entertainment, especially when the staff participated. It was a hoot and EVERYONE seemed to have enjoyed themselves. However, I have to say the highlights were the excursions and the guides. I consider myself fairly well travelled and I was so impressed with the quality and personalized style of the guides. They were the exceptional. 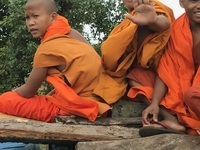 I booked the Saigon to Siam Reap route and I recommend that direction because you can then go on to Angkor Wat after the cruise which is not to be missed. This cruiseline did everything right. From the food to the excursions to the staff they could not have been nicer or more accommodating. They seemed to have thought through everything ahead of time and I would classify this less of a “trip” but an “experience”. Kudos to the chef, the captain and especially our ship host, Song. I had a special meal requirement and the staff was very helpful. Some might have thought it was corny but I also thouroughly enjoyed the entertainment, especially when the staff participated. It was a hoot and EVERYONE seemed to have enjoyed themselves. However, I have to say the highlights were the excursions and the guides. I consider myself fairly well travelled and I was so impressed with the quality and personalized style of the guides. They were the exceptional. 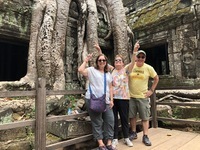 I booked the Saigon to Siam Reap route and I recommend that direction because you can then go on to Angkor Wat after the cruise which is not to be missed.